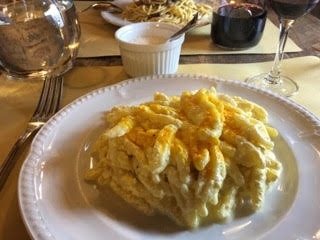 In order to avoid frustration and being turned away hungry, travelers in Italy should know that you are expected to be seated for lunch between 1:00pm and 1:45pm. Please don’t look for pranzo (“lunch”) at noon, or even at 2:30pm. Those are irregular hours to eat. Just like the unwritten rule about cappuccino (only in the morning and never after a meal), you should not look to be served too early nor too late. This tradition also applies to dinner, whereas many from the northern hemisphere are used to eating dinner 7 or 7:30pm, when in Italy best to not arrive before 8:30pm. You can even find staff still dining at 7:00pm. There is also a rule about time, and really I should be stating it’s best not to expect dinner before 20:30. As all over the Italian peninsula, a typical meal will start with antipasto (“pasto” in Italian means meal, so this translates to “before the meal”…a little warm up for you and your stomach). In the case of Toscana, this is often a " tagliere," a cutting board of prosciutto, salumi (Toscana serves finochiona which has fennel seeds), and other cured meats. For the “primo piatto” or first course, they like long pasta here in Toscana. You will find pappardelle, pici, long and thick, or ravioli. No penne, macaroni, or thin spaghetti or linguini. And about that salad- it is often not on the menu, but do ask!! Most places with have either verde (green) or mista (mixed), or perhaps rucola e pomodori (arugula and tomatoes). You may find it under “contorni” on the menu, where the side dishes are listed. They do prefer spinaci (spinach) in Toscana, which will be boiled with the fluid squeezed out, and it will be the best spinach you’ve ever had. And if you’re addicted to arugula like I am, delicate not bitter, there is “sacco di” or a ton of bitter greens to try, which are just wonderful. Do not miss them. Make sure to try puntarelle when in season, as well as friarielli, cicoria, and more. More to come as we soon depart for Abruzzo. This region is home to Italy’s largest national park, high mountains, transhumanza (that is the movement of the grazing livestock), hermits, monastery in the rocks, and of course their own local culinary traditions.